This annual event was kindly sponsored and assisted by "Always a Chance" for the fifth year running. The weekend commenced on Friday 11 May, as those people who were coming from further afield arrived to check into the on-site accommodation. On the Friday evening, 14 old and new members were re-acquainting themselves or socialising for the first time in the bar and hospitality areas of the Sunley Conference Centre, University of Northampton. A further six members arrived on the Saturday morning. The 20 members and four Trustees were from as far afield as Portugal (where one family now resides), Scotland and the Channel Islands. The tragedies that had befallen these families occurred in 11 different countries. A busy weekend had been planned with formal presentations on the Saturday, followed by a more relaxing 'wellbeing' day on the Sunday. Saturday morning started with tea and coffee in the main reception area of the Sulgrave Building. Following a short welcome session plus housekeeping matters, Eve outlined some of the reasons that bring our families together. Everyone attending had experienced the tragic loss of a loved one whilst they were overseas. The victim could have been on holiday, on business or just travelling the globe. The second reason for attending was because all of us had been disappointed with some aspect of our treatment by the UK agencies with whom we came into contact in the aftermath of the tragedy. Following the event which was the most traumatising, painful and unexpected event in our lives, we expected clear and transparent information, practical support, compassion, understanding and assistance. It was probably the first time in our lives we were thrust into contact with three government agencies here in the UK, the FCO, UK Police and Coroners, about which we had hardly any previous knowledge. Inviting Guest Speakers from each of these agencies gives the attendees the opportunity to speak directly to those who are responsible for ensuring that everything that can be done, should be done for the victims’ families. The Guest Speaker on the Saturday was from the Foreign and Commonwealth Office (FCO). Eve outlined the programme for the day and introduced our first Guest Speaker, the Head of the Murder & Manslaughter Team (MMT) at the FCO. The first session commenced with a round-table "5 minute" introduction by each of the members present. Each victim’s family had a chance to summarise and update the progress on each of their tragic cases. It is an extremely emotional part of the meeting and we try to handle it as sensitively as possible. We felt it was important that the FCO heard directly from the victims’ families. This part was ably chaired by Bren McLaughlin – it is always a difficult job to keep running within the allotted time. Members find that the ability to talk openly and honestly about their circumstances with similar, understanding families is extremely therapeutic, but it is very difficult to condense this into just 5 minutes each. This session inevitably overruns. The representative from the FCO then gave a short presentation, explaining their role and the way their team operates and their relationships with the UK police and Victim Support’s homicide service. There followed a Q&A session and the Head of the Murder & Manslaughter Team answered a lot of members’ questions and was given some unhappy feedback about the families’ earlier contacts with the FCO. It was clear from what families reported that some cases fall “between the cracks” when homicide is not a clear definition. An excellent lunch was served in the ample reception area of the Sulgrave Building. The afternoon session was a talk by Alan Penny, a Trauma Therapist from 'ASSIST Trauma Care' followed by questions and answers. He explained the differences in bereavement due to natural loss, tragic loss, traumatic loss, and the uniquely painful traumatic loss of a loved one overseas. He talked about Cognitive Behaviour Therapy (CBT) and referred to a useful book entitled 'The Body Remembers Trauma' which goes some way to explaining the links between physical ailments and earlier trauma. This talk was followed by an update on the Charity's activities. Eve led the way with a summary of meetings attended throughout the year with Parliamentarians, the FCO MMT and the UK police. Kim outlined some recent media liaison and awareness-raising work, Bren talked about the Helpline activities and Brian gave a summary of the Charity's fund raising successes, spending, and funding. The evening was spent on-site at a private session held in the student's union Pavilion with everyone relaxing, socialising and getting acquainted. A huge buffet was served with many different options. The student bar staff were friendly and helpful and it was a nice gesture for the University of Northampton to provide this facility and donate the food. There followed a candle lighting ceremony with members lighting a candle in memory of their loved one. Sheron encouraged everyone to say something about what they most remember about their loved one and interestingly many people remembered their laughter or their smile which is a great comfort to them. Thoughts and aspirations were written by each member on a card and placed in a sealed envelope ready for next year’s meeting to review. Then, attendees wrote personal messages on their own yellow ribbons, and then moved out into the pleasant sunshine to attach them to the Stephen Lawrence Memorial tree, a permanent feature on the University campus. After a coffee break, attendees then had the option to be involved in any one of three separate Wellbeing activities: Neck and Shoulder massage with Kate; Reflexology (feet or hands) with Bee; or simply a walk around the open fields surrounding the campus in the warm summer sun. Navigational errors led to a longer walk than was intended – thank goodness for maps on smart phones! At the conclusion of the day, all participants were asked, as always, to complete a questionnaire covering all aspects of the conference, the venue, and their thoughts on what they had found useful, enjoyed, or not. Murdered Abroad analyse and use this feedback to help plan and improve future years’ events. The Trustees of Murdered Abroad would like to express our sincere thanks to Nick Allen of the University of Northampton; Always a Chance for sponsoring this meeting; Hazel and Pete Kouzaris who worked hard on the organising and who are our link with the University; Jeanne; Helena; Kate and Bee. Thank you all for making the weekend a success. Trustees: Brian Chandler, Eve Henderson, Bren McLaughlin, Kim Spooner. Thirteen years ago, my sister died under brutal and tragic circumstance whilst travelling abroad - this was the catalyst for doing something different with my life. Twelve years ago, I married my husband, William. We sold a house, bought a boat and travelled under sail across the Atlantic Ocean, Caribbean Sea and South Pacific Ocean for nearly two years. When William and I travelled under sail 12 years ago I desperately needed some time out from life. Losing my only sibling had shocked me to the core - it was like part of me had died with her; she'd always been there and I just didn't know how to be or who I was, without her. The first ten years after my sisters' death went in a bit of a blur - I have very little memory of the day I was told she'd died or the following months. I also, due to shock, only have sporadic memory of the time William and I spent travelling. Three years ago, near the ten year anniversary of my sister's death I suddenly started struggling emotionally, feeling like I was spiralling down into the deep, dark cavity in my chest (most inconvenient when there are three small children at home who need you to be the Mummy they know and love). So, after struggling on for a while, earlier this year I accepted some help from Murdered Abroad - a charity that I'm involved with - in the form of a referral for counselling from Assist Trauma Care. Assist deal specifically with traumatic and complicated death and although I don't feel 'fixed' like I naively thought I might be after counselling, it has taught me to accept what I'm feeling rather than always trying to bury it, to go with it (to a certain extent), and that this too shall pass - meaning tomorrow is another day. The legacy of my sister's death is that I am left with is an inherent distrust of strangers and new people that I meet. Without necessarily realising, people have to work really quite hard to make it onto my list of the trusted few - especially if my children are in the equation. I always feel like I'm on high alert, unable to switch off and calculating the risks of actions and future actions, subconsciously. All this is happening whilst on the surface trying to appear perfectly normal. I don't want my children to know that anything is awry, I want them to believe that they are the same as their friends. On the whole I think I succeed with this - I am perhaps a little stricter with their freedoms to do things independently without adult supervision; more cautious than my friends are with their children. But I counteract this with choosing to live in a small, friendly Cornish village, where everyone knows everyone - there are eyes and ears everywhere looking out for the best interest of the village children (not just mine) whether they know it or not. Given my major anxieties (I had palpitations for a month before we set sail!) about meeting new people, you might think that going travelling is a pretty silly thing to do. But I'm hoping this might reset my trust button. As a by-product, sailing is another way I can control our small world. We are not ashore with loads of other travellers, we are at anchor and we get to invite aboard only those we want to. I do not want my sister's legacy for her small nieces to be that they are afraid to travel. I do want to teach them to become safe and savvy in their travel and I want them to experience different countries and cultures. Right now, they are small, and we can give them this wonderful experience that will stay with them for a lifetime. Later, when they are old enough to travel without us I will find it hard to let them go. But I will. And I won't let them know that it scares me to let them go. Because I will not let this thing that happened to my sister, be their legacy. For the past ten years we have been raising our 'crew' - three girls aged 10,7 and 4. Now we want to do something different as a family. We always said that we would love to do some blue water cruising with our own children, having met so many cruising families last time around who were having a great time. Giving our children time out of the classroom and having the world as their teacher is also very appealing - so much of their young lives are cooped up in four walls at school. This is not a judgement on our tiny village school which is great and everything I want from a village school - it is an expression of my desire for my own children to learn about the world through experience and adventure, for a small part of their education at least. We have been trying to get to this point again ever since we returned from our last trip. It has taken 12 years to be in the right place at the right time with the right boat. There has been a lot sweat and tears on a very tight budget to make this expedition happen. Normal life has been going on, on the surface - work for William and I, school and pre-school for the kids along with numerous kiddie club commitments - swimming lessons, dinghy sailing club, rowing club, etc., etc. And a lot of frantic kicking under the water to keep our heads afloat from all the jobs - refit the boat (an old Crossbow 40 sailing yacht), declutter the house, find tenants (yes, this means cleaning and tidying it for every viewing), empty the house and finally sign it over to the tenants and lastly both leave work. William was lucky and has been granted a year's unpaid leave with his job as a professional skipper to come home to. I was not so lucky - working as a physiotherapy technician for the NHS I was not granted unpaid leave, so I resigned; hoping I will find work on the NHS bank staff on my return or maybe something else. Travel broadens minds, horizons and breaks down social barriers. It is good for my soul and I want to show my children some of the world. The fact that we choose to do this under sail is a bonus - we love sailing as family (William and I met sailing and the kids have been sailing since they were in nappies). We get to travel the globe under our own steam (or wind!) and that is pretty cool. This annual event, sponsored and assisted by Always a Chance, commenced on the 12 May Friday evening with some of the 17 old and new members re-acquainting themselves, or socialising for the first time, in the bar and hospitality areas of the Sunley Conference Centre, University of Northampton. The 17 attendees plus the four Trustees came from as far afield as Ireland, Scotland and Spain (one of our members now lives in Spain) covering tragedies occurring in 12 different countries around the world. A busy weekend had been planned with some serious guest speakers leading the way on the Saturday, followed by a more relaxing wellbeing day on the Sunday. Tea, coffee and biscuits were provided by the University on arrival. On display were some of Murdered Abroad’s new publicity material - leaflets and banner stands carrying the striking new Murdered Abroad logo. After the Welcome and Housekeeping matters, Saturday began with a presentation by Simon Hare, Producer and Documentary maker of the BBC's Inside Out programme. His topic was "Dealing Effectively with the Media". As an example of his work he showed a video featuring two of our members (who were present at the meeting) that had been broadcast earlier this year. These weekly regional Inside Out features are 9 minutes long and are produced, in turn, by 11 different BBC regions (Simon being responsible for the East Midlands area). The video had been filmed and produced with investigative help from the University of Derby's Justice for All team, headed by ex-Senior Investigating Officer, Tony Blockley, and opened new insights into our members’ yet unresolved case in Italy. to give feedback to the media afterwards. Simon stressed the benefits of developing good relationships with trusted local media presenters, where continuity can be of more benefit than occasional fleeting interest from National media. This was followed by a round-table 5 minute introduction by each of the members present. Each victim’s family member had the opportunity to summarise and give an update of the progress made on each of their tragic cases. This part was ably chaired by Bren, always a difficult job to keep within the allotted time. Members find that the ability to talk openly and honestly about their circumstances with similar, understanding families is extremely therapeutic, but it is very difficult to condense this into 5 minutes each and this part therefore eventually spilled over into the afternoon session. The afternoon session started with a dynamic Question & Answer PowerPoint presentation given by Sophie Scragg, an Outreach Officer for Parliament, on the subject of "An introduction to your Parliament: Engaging and Influencing". To illustrate her point she asked some searching questions, probing how much we, the general public, actually understand about the differences between Government, Parliament, the House of Commons, and the House of Lords. She then moved on to cover the different campaigning buttons that can be pushed to either champion or to promote specific causes, or to cause investigation of particular problems. There are many ways to gain attention, from petitioning, to Parliamentary questions (PQ’s) and Sophie covered the activities of All Party Parliamentary Groups (APPG’s) and Select Committees. This was followed by an update on our Charity's activities. Eve led the way with a summary of meetings attended by Murdered Abroad Trustees during the early part of 2017. They included meetings with politicians, the Foreign & Commonwealth Office (FCO) Murder & Manslaughter Team and the UK police. Kim outlined the on-going process of developing our new Murdered Abroad website, Bren talked about the Helpline activities and Newsletter and Brian gave a summary of the Charity's finances, both spending and funding. Saturday evening was spent on site. The University provided a private session in the Student Union’s Pavilion. It was very informal, everyone was relaxed after a fairly intense day, socialising and getting acquainted. A fantastic buffet was served by two very helpful students. Sunday morning formally commenced with a Reflections and Remembrance service - an extremely moving session by Philip Painter, a retired police officer from Kent with 30 years experience including homicide investigations. He now runs his own consultancy business assisting the Charity sector. He read poems and had prepared a very touching and thought -provoking non-denominational service, remembering each of the victims, with an individual candle lighting ceremony. Background music 'Sailing By' and 'Across the Bridge of Hope' was played. It was an emotional and therapeutic ceremony. Philip asked attendees to review the individual hopes and aspirations that they had written down at the previous year's meeting, and maybe set some new ones. After REM's 'Everybody Hurts', attendees wrote personal messages on yellow ribbons provided by Hazel Kouzaris and everyone moved out into the sunshine to attach them to the Stephen Lawrence Memorial tree, a permanent feature on the University’s Park campus. Attendees then had the option to be involved in any one of three separate Well-Being activities; Neck andShoulder massage with Kate Hetherington; Reflexology (feet or hands) with Belinda (Bee) Burton; or simply a walk around the open fields surrounding the campus in the pleasant summer sun. At the conclusion of the day, all participants were asked, as always, to complete a Feedback questionnaire covering all aspects of the Conference, the venue, and their thoughts on what they had enjoyed, or not. Murdered Abroad analyse and use this feedback to help plan and improve future years’ events. The Trustees of Murdered Abroad would like to express our sincere thanks to Nick Allen of the University of Northampton, Always a Chance for sponsoring this meeting, Hazel and Pete Kouzaris who worked hard on the organising and who are our link with the University, Jeanne, Helena, Kate and Bee. Thank you all for making the weekend a success. Investigators are to re-open the case of a mother who died in Australia 17 years ago to see if she was murdered. Mother of two, Angela Reads, was found drowned in a river in 2000, but a coroner ruled he could not be certain whether she committed suicide or was killed. Angela's mother, Pat Tompkins, from Saltdean (near Brighton), remains convinced her daughter was murdered. After a recent meeting with the Australian High Commissioner, who confirmed that the case will be looked at again, she said: "I will keep fighting for the truth". Sources: http://www.itv.com/news/meridian/update/2017-05-06/investigators-to-reopen-case-of-mother-who-died-in-australia/ & Metro Newspaper Monday, May 8, 2017. What happens to those affected by homicide in a foreign country? Two of Murdered Abroad's Trustees were delighted to meet Liam Brolan, Lecturer in Criminology at Birmingham City University, recently to share their experience of supporting bereaved families. In his subsequent blog post, Murdered Abroad: Supporting those affected by homicide in a foreign country, Liam says: "Through their proactive approach to improving the help and support that is available, Murdered Abroad are undoubtedly leading the way in ensuring that families receive the information they need, when they need it most. In summary, they offer an invaluable source of support to families across the United Kingdom who have been bereaved through the murder or manslaughter of a loved one abroad." We look forward to working with Liam on his forthcoming PhD research - a study which seeks to understand the impact, extent and law enforcement implications of Britons murdered abroad. Murdered Abroad is delighted to have partnered with 5 Essex Court who can provide advice and assistance on inquests and coronial law to families bereaved by murder or manslaughter abroad. A coroner in England or Wales will normally hold an inquest if the person died a violent or unnatural death overseas and their body is returned to their district. For many families, the inquest will be their only route to answers and information in this country and as such is a vital process that they need to understand. Families should participate in the inquest proceedings and have proper representation. 5 Essex Court has particular expertise in inquests and members of chambers have appeared in many of the most high profile cases in recent years including The Tunisia Shootings. Murdered Abroad is extremely grateful to Senior Clerk Mark Waller who has arranged for his colleagues to volunteer their time and expertise to assist our families. If a murder occurs in a country which still has the death penalty, families face added barriers in their fight for justice. As reported in The Telegraph in September 2016, four countries considered to be industrialised still execute criminals: the US, Japan, Singapore and Taiwan. The most recent countries to abolish all capital punishment are Guinea (2016), Nauru (2016), Congo (2015), Suriname (2015), Fiji (2015), Madagascar (2012), Latvia (2012) and Gabon (2010). Are you bereaved through murder or manslaughter in one of the above countries? Do you need help? If so, please get in touch. Murdered Abroad is pleased to be working with the University of Derby on a pioneering initiative called “Justice For All”. Drawing together expertise from criminology, law and forensic science, students are examining deaths abroad, where there has been no inquest or the deaths were not adequately investigated. Tony Blockley, Lecturer in the Psychology of Criminal Investigation from the University of Derby, explained: “If someone from outside of the UK dies here in the UK, the police provide a full investigation to find out what happened, but if someone from the UK dies overseas, UK police forces do not always get involved if it is not in their jurisdiction. The service families get from non-UK police forces can sometimes be poor, misleading and, unfortunately, does not constitute an investigation - a miscarriage of justice. As part of the Justice For All module, students have worked on a number of cases including Denyse Sweeney, who died in Goa in 2010. The Indian authorities said her death was drugs-related but a UK pathologist came to the conclusion it was due to a head injury. At an inquest (in 2012 in Derby), a toxicology report revealed there were no drugs in her system and the probable cause of death was a head wound. Following the work by students and the case featuring on BBC’s Inside Out, the Indian authorities re-opened Denyse’s case. More recently, the students have been working on a case involving Claire Martin who died in Italy in 2014. Claire had multiple stab wounds to her neck and the Italian authorities closed the case as a suicide. Following the work by the students and other specialists, the evidence indicated it was murder. The investigation was also featured on BBC’s Inside Out (February 27, 2017). The topic of UK police support for investigations of murder of UK nationals abroad was raised in Parliament on 17 January 2017. Dominic Raab MP said: "I wish to raise a specific local case as an illustration of the wider plight of British families whose loved ones are murdered overseas. I want to understand what has gone wrong in my local case, which concerns Ollie Gobat, a young businessman murdered in St Lucia, whose parents are my constituents. On their behalf, my aim is to try to secure some sense of justice for a truly distraught family and, in the process, to glean a wider sense of what British policing support other families in this appalling situation can and should reasonably expect in pursuit of the perpetrators of these heinous crimes." The full Hansard transcript can be read here. This annual event, sponsored and co-organised by "Always a Chance" for the third time, commenced on Friday evening (6 May 2016) with 26 old and new Murdered Abroad members re-acquainting themselves or socialising for the first time in the hospitality areas of the Sunley Conference Centre, Northampton University. The attendees were the families of 16 victims, bereaved by tragedies in 10 different countries. Saturday started with a round-table introduction by each of the members present. Each victim’s family had a chance to summarise and update the group on the progress of each of their tragic cases. Members find that the opportunity to talk openly and honestly about their circumstances with other families who truly understand, is extremely therapeutic. The first Guest Speaker of the weekend was Tony Blockley, a retired police Senior Investigating Officer who now heads the Criminology faculty at the University of Derby. Tony gave an expert’s opinion on "Supporting families following Murder Abroad". His fascinating talk was based on his own experiences and illustrated using his more recent work in Northern Ireland supporting families bereaved during "the Troubles". The second session of the morning was delivered by Georgie Vestey, a campaign strategist, based on her approach of: "Nobody is listening - what can I do next?". Everyone found her determination and innovative approach to a variety of ways of "getting the message across" to be really energising and motivating. After an excellent lunch in the conservatory and gardens, everyone returned to a "question and answer" session with the guest speakers of the morning. This was followed by an update on Murdered Abroad's activities and the reasons for our name change from SAMM Abroad to Murdered Abroad. Eve Henderson (Co-Founder, Trustee & Director) led the way with a summary of meetings attended throughout the year with politicians, FCO and the UK police. Brian Chandler (Trustee & Director) gave a summary of the Charity's finances and funding and Bren McLaughlin (Trustee & Director) talked about the Helpline activities. Afternoon tea was followed by reflections of the day and the evening was spent on site with everyone getting further acquainted. Sunday morning commenced with an extremely moving session by Philip Painter, a secular celebrant from Kent. He read three poems and had prepared a very touching and thought-provoking non-denominational service. He read out a roll call remembering each of the victims with an individual candle lighting ceremony around a Remembrance Tree provided by members Hazel and Pete Kouzaris. It was a very moving, emotional, and therapeutic ceremony. The second session was delivered by Tim Elliston from "The Happy Starfish" which concentrated on Mindfulness - the ability (which can be learned) to focus our own thoughts in more positive ways, once we understand our own thinking processes. Mindfulness is essentially a tool to help individuals to replace negative thoughts with positive motivation. Attendees then had the option to be involved in four separate wellbeing activities; Yoga for relaxation; Neck, shoulder and hand massage; Gongs for relaxation and meditation; or simply a walk around the open fields surrounding the campus in the pleasant summer sun. At the conclusion of the weekend, all participants were asked to complete a questionnaire covering all aspects of the Conference, the venue, and their thoughts on what they had found helpful or not. Murdered Abroad's Trustees analyse and use this feedback to help plan and improve future years’ events. If you are bereaved through murder or manslaughter abroad and would like to join us at our 2017 Wellbeing Conference, please get in touch. Claire Martin's parents have many unanswered questions about their daughter’s death in Campania in 2012. The Guardian reported on their plight on 27 February 2016. Sunday was the culmination of our 2nd Annual Wellbeing Conference sponsored by Always A Chance and the University of Northampton. Guest speaker, Georgie Vestey, gave her expert insight into effective communication with the media following events creating tragedy and grief. American author of "Grief Like No Other", Kathleen O’Hara, also spoke at the event and led a very moving ceremony at the tree of remembrance. Families placed a yellow ribbon on the tree in memory of loved ones who had been murdered overseas. Much-needed therapeutic sessions were also held during the weekend, including yoga and massage. The weekend was a huge success with families expressing how much they appreciated a forum which enabled them to share their stories and feed into opportunities to lobby government for greater support for families affected by homicide abroad. This important event could not have happened without the generous support of Always A Chance and the University of Northampton and we extend our gratitude to them. A lack of confidence/doubts about the post mortem (if your loved ones body is found) or doubts about the competency of the investigating authorities. We held our first "wellbeing" members’ meeting in 2014 at the Sunley Conference Centre, University of Northampton. After a series of previous meetings with guest speakers such as MPs, police, or representatives from government agencies (eg: FCO, NPIA), we thought it would be good to have someone who understands the emotional side of what has happened to us. 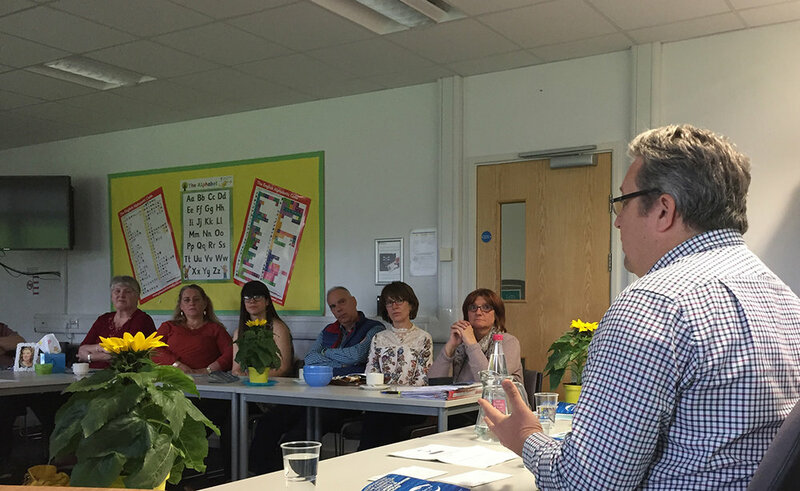 Consequently, we were delighted to secure Dr. David Trickey, a Clinical Psychologist who specialises in traumatic bereavement, to be our Guest Speaker at this event. David understands the problems families face following a homicide and explained in layman's terms, what happens to us, our minds and our bodies, after such a tragedy. But things can become stable, which becomes a “new normal”. The programme also included a break-out session for young adult siblings. We have always felt that our families' young people might welcome the idea of having a couple of hours in the company of other siblings to talk over how the death of their brother or sister has affected them and the impact it has had on their lives. Help organisations who support victims and their families trying to overcome the emotional impact of a violent attack or the sudden death of a loved one. We are very grateful to Hazel and Pete and the Vice Chancellor of the University of Northampton who agreed to support our event by covering the cost of the hire of the venue for the day. We think the focus on wellbeing was well-received by our members and we plan to extend this annual meeting to a two-day residential wellbeing conference next year. A recent Westminster Hall Debate considered the case of Gary Dunne. Stephen Twigg MP, Shadow Minister (Justice) (Political and Constitutional Reform) began the debate on 11 December 2013 by explaining: "Gary Dunne was tragically murdered on 3 March 2006 in Benalmadena on the Costa del Sol in southern Spain. He was attacked by 12 men and stabbed to death with a machete by Victor Posse Navas. For his family, nothing will bring Gary back. Every day, they remember him as a son, a partner and a father. Although nothing can be done to soften the horror of the tragedy for the family, much more could have been done, and still can be done, to make life that bit easier for them. "Our British consular staff deal with thousands of deaths of British nationals around the world, often in difficult, traumatic and complicated situations. They deserve praise for their work. More often than not, the support from consular staff is of the highest standard. In this case, however, the Dunne family were left vulnerable; they felt alone and received little help. In the midst of dealing with the news of the cruel murder of their son, they were told that they would have to pay to bury him, not in Liverpool, but in Andalucia in southern Spain, due to local legal restrictions about hygiene. The Spanish authorities said that before Gary could be brought home to Liverpool, he would have to be cremated in Spain. The family received no assistance from the Spanish police and were not met by liaison officers." Read more here, including the response from Hugo Swire, The Minister of State, Foreign and Commonwealth Office. In October 2006, representatives of Murdered Abroad (then called SAMM Abroad) met the Minister of State for Constitutional Affairs, Harriet Harman, and discussed the government's Draft Coroners Bill's proposal to remove the automatic right to a UK inquest following the suspicious death of a UK citizen abroad (except in a few named circumstances). Harriet Harman requested that we compile evidence illustrating the importance to bereaved families of a UK Coroner's inquest when a UK citizen is the victim of murder or manslaughter abroad. Our members provided this evidence, showing how a UK inquest had helped them find out more about their loved one's death and get justice abroad. We were very grateful to all our members who helped in this difficult process by providing evidence. We welcomed the Ministry of Justice statement that the Draft Bill had been changed. It now conveys on Coroners the same duty to investigate a death abroad, as a death in the UK. Since 2001, our organisation has provided feedback on coronial reform many times. We opposed the Coroners Draft Bill in its recommendation to abolish mandatory inquests on the repatriation of a body after a suspicious death abroad. We proposed to instead seek inquests after the murder or manslaughter of a British citizen even if a body is not repatriated, and to widen the responsibilities of the Coroner after murder abroad.